With proposed developments at Tapia Canyon and our pending proposal for a bike park at Castaic Lake State Recreation Area, there are some changes coming to trails and bike access in the Castaic Area. We’ve long known that the trails of Tapia Canyon, in particular, would be at risk once the developers move forward with their construction plans. We’ve had several meetings with the developers who seem willing to work with us to preserve some trails in the area. 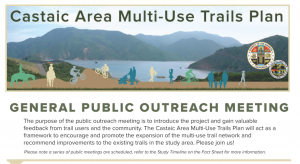 In response to the public’s need for future planning, 5th District Supervisor Michael Antonovich has authorized the development of the Castaic Area Multi-Use Trail Plan. The County will survey existing trails, proposed developments, desired trail connections, and gauge future trail needs to support a growing population. This will be a similar process to the Santa Susana Mountains Trail Master Plan, a process in which we participated from April 2012 until it’s completion last year. The first general public meeting is scheduled for Thursday, August 20th at 6:30 p.m., at the Los Angeles County Castaic Public Library, 27971 Sloan Canyon Road, Val Verde, CA 91384. 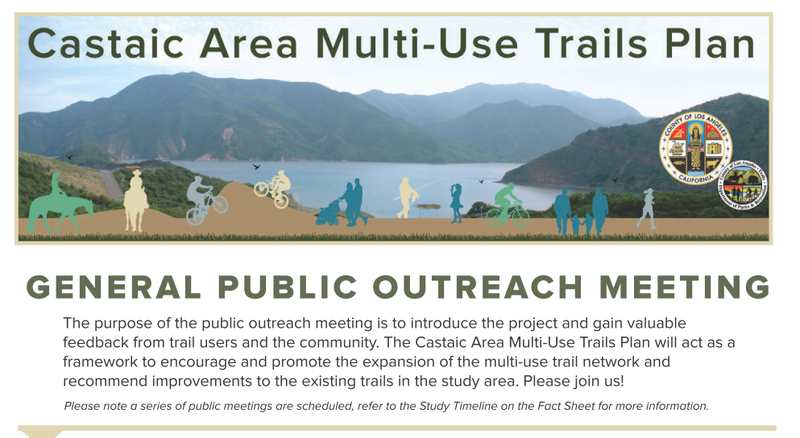 This meeting will be followed by three user-group specific meetings for mountain bikers, equestrians, and hikers. Currently the mountain bikers’ meeting conflicts with Interbike, so we have asked if that can be rescheduled. Last year CORBA submitted a comprehensive Bike Park proposal for the Grasshopper Canyon area of Castaic Lake State Recreation Area which we would like to see included in this planning process. This entry was posted on Tuesday, August 18th, 2015 at 3:48 pm and is filed under Environment, Santa Clarita Valley, Trail Access. You can follow any responses to this entry through the RSS 2.0 feed. You can leave a response, or trackback from your own site.